This is a Chinese name; the family name is Hu. Hu Shuli (胡舒立; born 1953) is the founder and publisher of Caixin Media. She is also the professor of the School of Communication and Design at Sun Yat-sen University and the adjunct professor of the School of Journalism and Communication at Renmin University of China. The first issue of Century Weekly under the aegis of Caixin Media was published on January 4, 2010. Ms Hu serves as a member on the Reuters Editorial Advisory Board and a member of the International Media Council of the World Economic Forum. She is a global board member of United Way Worldwide, and a member of the Board of Trustees of the International Crisis Group. Hu Shuli was born in Beijing, from a lineage of notable journalists: her grandfather, Hu Zhongchi, was a famous translator and editor at Shen Bao and his older brother Hu Yuzhi (1896–1986), "an early proponent of language reform, the use of Esperanto, and realism in literature," was involved in editing and publishing. Her mother, Hu Lingsheng, was a senior editor at Workers' Daily. Her father, Cao Qifeng, had a midlevel post in a trade union. Hu Shuli attended Beijing's prestigious 101 Middle School. The Cultural Revolution brought criticism to her family (her mother was placed under house arrest). She became a Red Guard and traveled around the country, trying to educate herself as best she could. After two years she joined the People's Liberation Army, and when college classes resumed in 1978, she won entrance to the Renmin University of China. ( People's University of China), from which she graduated in journalism in 1982. She also studied development economics as a Knight Journalism Fellow at Stanford University in 1994 and earned an EMBA through Fordham University and the China Center for Economic Research at Peking University in 2002. Before Caijing, she was working as assistant editor, reporter and international editor at the Worker's Daily, China's second largest newspaper. She joined China Business Times in 1992 as international editor and became chief reporter in 1995, resigning in 1998 to start Caijing. In addition, Hu served as financial news chief for Phoenix TV in 2001. She is author of several books, including New Financial Time, Reform Bears No Romance and The Scenes Behind American Newspapers. She has had the distinction of being ranked among BusinessWeek's "The Stars of Asia: 50 Leaders at the forefront of change." 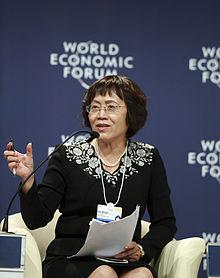 In 2006, Hu was called one of the most powerful commentators in China by the Financial Times, and The Wall Street Journal cited her among the "Ten Women to Watch" in Asia. She was Knight Journalism Fellow at Stanford in 1994. She was awarded the 2003 International Editor of the Year by the World Press Review, and the 2007 Louis Lyons Award for Conscience and Integrity in Journalism by the Nieman Foundation at Harvard University. She was awarded the Missouri Honor Medal for Distinguished Service in Journalism by Missouri School of Journalism in 2012.She was named among "Women in the mix 2013" the year's top 50 for achievement and influence in business by Forbes. The US magazine Foreign Policy named her as one of the top 100 public intellectuals in the world in May 2008, alongside such names as Noam Chomsky, Umberto Eco, and Salman Rushdie. Hu was named one of the World’s Greatest Leaders by Fortune in 2017. She was awarded an honorary doctorate degree from Princeton University in 2016. She was awarded Ramon Magsaysay Award in 2014 and Missouri Honor Medal for Distinguished Service in Journalism in 2012. She was listed among Top 100 Influential People of 2011 by Time magazine. She was twice named one of Top 100 Global Thinkers by Foreign Policy magazine in 2009 and 2010. The Caixin editorial team under her leadership won the 2011 Shorenstein Journalism Award from Stanford University. In 2011, she won Taiwan’s Hsing Yun Journalism Award. In 2007, she received the Louis Lyons Award for Conscience and Integrity in Journalism from the Nieman Foundation at Harvard University. In 2006, Ms Hu was called China’s most powerful commentator by the Financial Times, and The Wall Street Journal cited her as one of Asia’s Ten Women to Watch. Ms Hu was named International Editor of the Year by the World Press Review in 2003 and one of BusinessWeek magazine’s Fifty Stars of Asia in 2001. ^ Barboza, David (31 December 2009). "Pioneering Editor Takes Over New Magazine in China". The New York Times. Retrieved 2010-01-14. ^ Kirk A. Denton, Modern Chinese Literary Thought: Writings on Literature, 1893-1945 (Stanford University Press, 1996: ISBN 0-8047-2559-4), p. 500. ^ Osnos, Evan (20 July 2009). "The Forbidden Zone". The New Yorker. Retrieved 2010-01-14. ^ Clifford, Mark L. (2 July 2001). "The Stars of Asia". BusinessWeek. Archived from the original on 15 January 2010. Retrieved 2010-01-14. ^ "China's Changing Media Landscape". China's Media Landscape. ^ "The Top 100 Public Intellectuals--the Final Rankings". Foreign Policy. June 2008. Retrieved 2010-01-14. ^ Hu Yinan (14 October 2009). "Caijing Magazine rocked by resignations". China Daily. Retrieved 2010-01-02. ^ Ansfield, Jonathan (9 November 2009). "Editor Departs China Magazine After High-Profile Tussle". The New York Times. Retrieved 2010-01-02. ^ Vacca, Diane (15 December 2009). "Journalist Flouts Beijing, Part 2: "She's got blood on her blade and her clothing smells of gunpowder"". Women's Voices for Change. Retrieved 2010-01-02. This page was last edited on 30 March 2019, at 01:30 (UTC).